Via 2005 Boards member Chris McFeely we have some great Exclusive G1 Deleted Scenes That Were Shown At TFNation 2017. This past Friday, he hosted “Heavy Metal War: Recitifed” at UK convention TFNation 2017, which was a “making of G1” panel that showed how an episode was created. 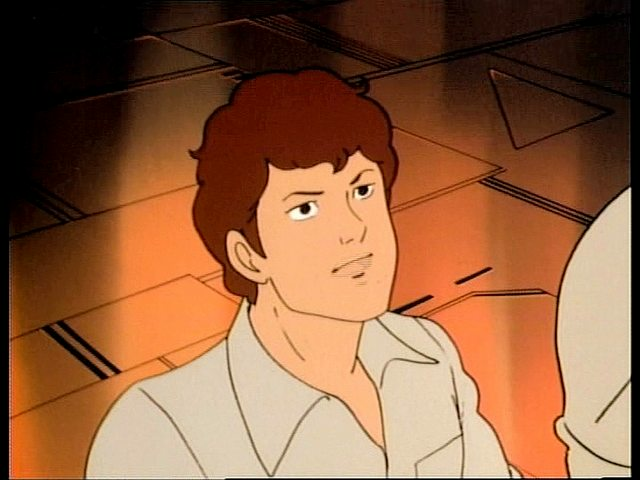 This was the first-ever honest-to-god G1 deleted scenes videos, created using those same storyboards, and never-before-head studio recordings of lost dialogue recovered by the Mapes brothers of Transformers@TheMoon, whose other deleted audio finds we’ve been hearing this year. Fortunately, the videos have been shared online and in our boards for all your viewing pleasure. You can click here to go through for the playlist or go straight for the individual scenes. You can watch some of the videos after the jump and then sound off your impressions at the 2005 Boards! You know, times like these kind of make me realize just how spoiled we are, as a fandom. How many cartoons can you think of from the 80's that have a following loyal enough to get official backing for this sort of thing? Imagine if Hasbro or whoever owns the old Galoob properties now released all the cancelled Dinosaucers toys. What are the odds of something like that happening? Wow…wish these were going to be released on DVD. So cool! You guys rock…and roll out? Ok, lame, BB must be rubbing off on me. Still, G1 is my fav show. Ah, that's because ALL the audio is from the recording! I synched the muted animation up to the parts that matched the finished episode, then added all the music and sound effects back in myself. Oh, there's a LOT more messed-up stuff in the episode that what I put in the video – I could probably have filled a third of the presentation alone just by going through it all, but I had to keep myself to a few minutes. Think I found one you missed from "Unfinished Animation"
Glad you like! While more deleted G1 audio is available on the Mapeses YouTube channel, and more recordings have yet to be posted, this is very likely the only one we'll be able to create videos like this for – because no other G1 episode has their entire set of storyboards out in the wild! 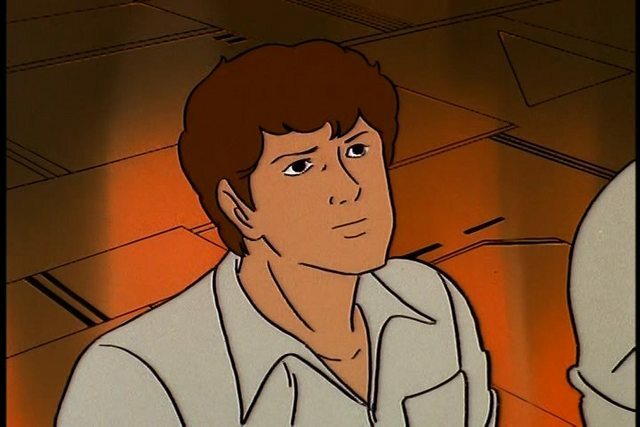 Though if anyone does own them who posts here, which is likely, please let Chris or either myself or my brother know as I would very much like to see Chris animate the rest using the l original storyboards. G1 voice acting is gold. Thanks so much for this, it's brilliant. Is this the only episode you've given the treatment to? Or are there more in store? This past Friday, I hosted "Heavy Metal War: Recitifed" at UK convention TFNation 2017, which was a "making of G1" panel that showed how an episode was created. If you weren't there – as, uh, I imagine most TFW2005ers weren't! – you can now watch the videos shown during the panel online, which include an animatic recreated from storyboards, an unfinished animation comparison, and MOST important, the world-exclusive showing of the first-ever honest-to-god G1 deleted scenes videos, created using those same storyboards, and never-before-head studio recordings of lost dialogue recovered by the Mapes brothers of Transformers@TheMoon, whose other deleted audio finds you've been hearing this year. I love it, love it love it !!!! At Megatron. Goodbye the German Walter P-38 and hello combat aircraft with a fusuion cannon! Hah! Even in deleted scenes there is an error! Wow, this stuff is awesome! It would be amazing if some fans actually animated these deleted scenes one day. At least having a tank barrel hanging off the underside of Megatron's TR toy jet mode makes more sense. Ats odd I did. I didn't see it. It's in the third video, during the Prime vs Megs one-on-one fight. 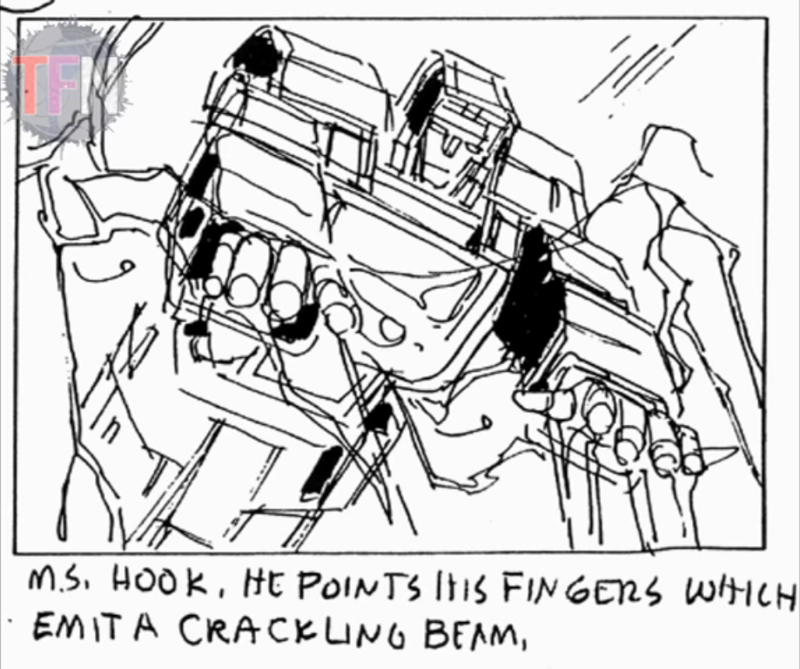 A storyboard shows Megatron using the abilities gained from a seeker's power chip rectifier to transform into a plane. 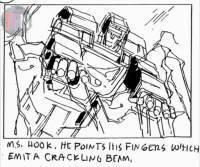 There's also a deleted scene as the Cons are flying to the battle site which touches on the concept, where Starscream complains about not being able to transform because Megs has taken that power. 3rd video linked in the first post.